The Clinton County Bulldogs pulled off a grand victory for the football program last Friday night by defeating Metcalfe County, 22-12 to move to 5-0 on the year. Never in the history of the program has the football team started off the season with an undefeated record through five games. Friday night’s win also marked the first time since the program was rebooted and the two teams started playing each other, that Clinton County has won. The Dawgs were defeated in 2011 16-0, 45-14 in 2012, 40-6 in 2013, and 46-0 in 2014. In 2015, Metcalfe County defeated the Dawgs 48-0 and in 2016 the Dawgs fell 54-20. Last year, 2017 was the closest Clinton County had come to defeating the Hornets with a game that came down to the final seconds. The Dawgs were defeated 29-26. Friday night, Clinton County ended a seven year losing streak to the Hornets of Metcalfe County with the 22-12 victory. 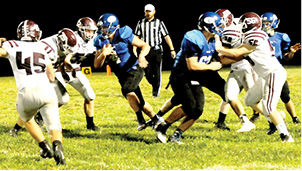 Clinton County will be on the road this week as the team travels to Lynn Camp with a kick off time set for 7 p.m.
A detailed wrap-up of Friday night’s win over Metcalfe County can be found in this week’s SPORTS, page 7. Noah Pruitt ran the ball down the field in the first half against Metcalfe County Friday night. The Dawgs went into the locker room at the half down by four, 12-8, but held Metcalfe County in the second half to pull off the 22-12 win and to move to 5-0 on the year.